Buster Moon (Matthew McConaughey) is a Koala who owns a beautiful theatre. Trouble is, every show he puts on is a failure and now he faces serious financial problems as the bank threaten to repossess it, unless he pay all of the money he owes. In a moment of inspiration, he decides to stage a singing competition with the a $1,000 prize for the winner. Although he doesn’t have $1,000. And his secretary (Garth Jennings) mistakenly sets the prize fun on the promotional material as $100,000. Jason (To my Mum, as the promotional stuff plays): Are you excited about the film? Are you glad to be here? Mum: No, not really. I could be sat at home watching adverts. Not the most promising start to a cinema trip, then. 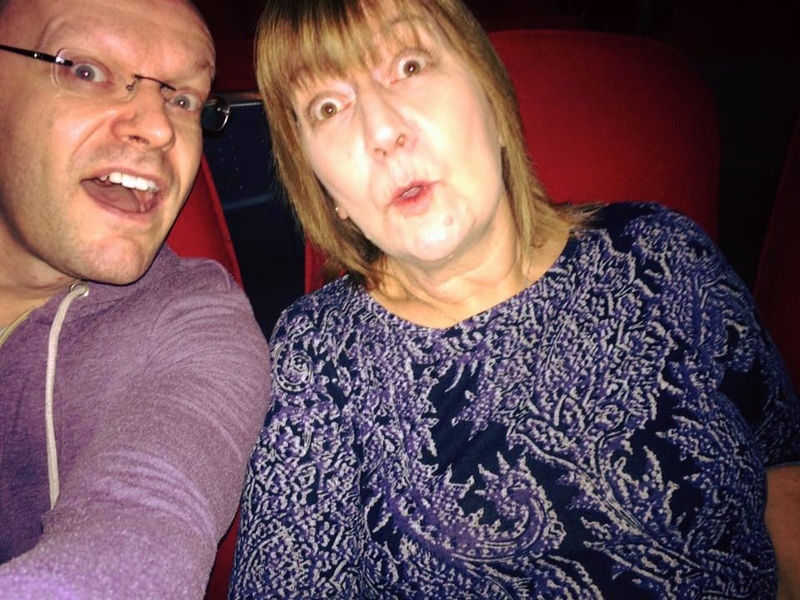 But then, it’s been about 30 years or so since my Mother last went to cinema. Or so we estimate. The last time she visited, it was either Who Framed Roger Rabbit, 1988 or a film about a very tall building on fire that was playing. This was one of my Christmas gifts to her; a trip to the place I call my second home and a bite to eat afterwards. And I had, for once, got the present correct. A fan of X Factor on the TV I thought that a fun, colourful, animated film about a singing contest, would be just the ticket. And so it proved to be. The pace of the film is not for the faint hearted. We hurtle through a one reel introduction to half a dozen or characters and this brisk feel is commendably maintained throughout. Matched by swooping ‘camera’ work and an incredible roll-call of 64 pop songs from Lady GaGa’s Bad Romance to Wham’s Wake Me Up Before You Go Go. We are treated to a different song a minute so, no matter how resistant you are, you’ll be swept along by the sheer force of musicality on this film. 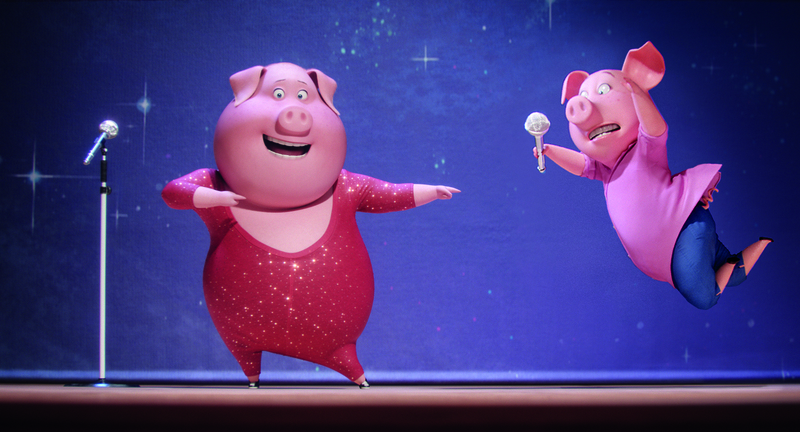 Pigs may fly…and dance. Gunter and Rosita rehearse in Sing (2016). Image courtesy of Universal. Something that my Mother picked up on and was charmed by, was how carried away the audience was at our screening. Young and old alike were clapping their hands, dancing in the seats and singing along. In time, there may well be ‘Sing-a-long-a-Sing‘ screenings. Presumably this was a dig at me about not doing the washing up, so let’s move back to the film! I’m not a fan of The X Factor, no not one little bit, but this film raised a smile with the description of Buster Moon, the showman impresario who fronts the talent contest here as a no-nonsense, opinionated judge, as a “washed up, deluded charlatan”. Cowell the Koala? Perhaps the great man himself will like this thinly veiled portrayal, so deeply inured is he into the popular consciousness. 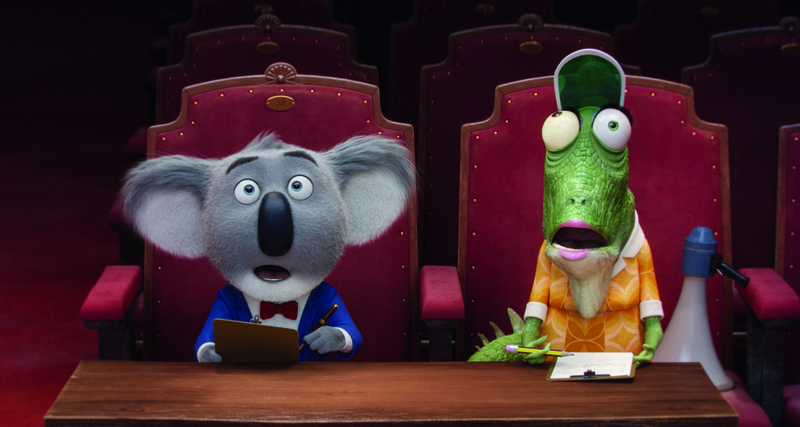 Buster Moon and Mrs Crawly sit in judgement in Sing (2016). 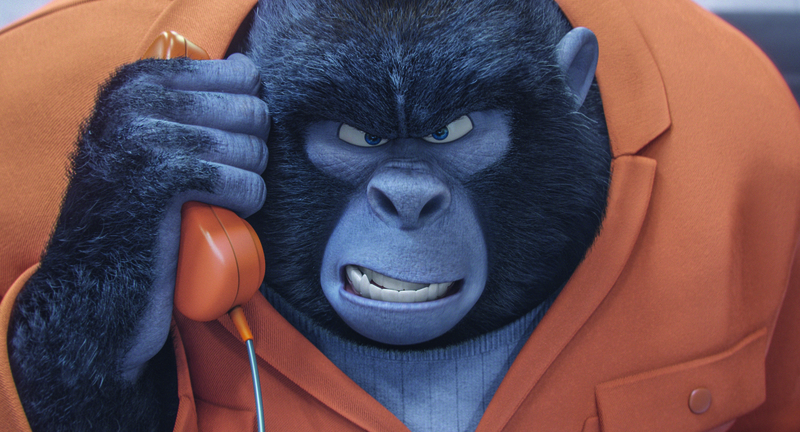 Image courtesy of Universal. Simon Cowell would certainly appreciate the world this film is set in, a bright and cheery place packed with fame hungry desperates. Whether brash and aggressive (Mike the rat, who bullies as he busks and mugs his terrified ‘audience’), harassed at home and lacking in confidence (Rosita the pig), or nervous to the point of being mentally ill (elephant Meena), on every street and in most houses, everyone hopes to earn their 5 minutes in the spotlight and, unwittingly, line Simon/Buster’s parched coffers. Should I then come out of the celluloid closet and proudly state my admiration of animated film? This isn’t the first such film I’ve seen recently and felt more than just a sneaking respect for (Moana was another 4/5 star delight). Again, my eyes are boggled by the remarkably high quality of the animation (Buster’s fur, that he later utilities to start-up an ingenious and cost-effective car wash; the reality of the groceries on the shelf at a supermarket). An enjoyable film, lots of fun. One for both kids and the grown ups. Producers: Janet Healy, Christopher Meledandri. Matthew McConaughey, Reese Witherspoon, Seth MacFarlane, Scarlett Johansson, John C. Reilly, Taron Egerton, Tori Kelly, Jennifer Saunders, Jennifer Hudson, Rhea Perlman.